The Historic Motor Sports Association (HMSA) Spring Club Races 2016 was staged April 9-10 at Mazda Raceway Laguna Seca in Salinas, California. The two-day event featured Triumph with a single-marque race on the 11-turn, 2.238-mile road course on the Monterey Peninsula. California has been suffering a severe drought for the past five years so the rain that came on Sunday was a welcome sight, unless you were sitting in pre-grid on slicks when the sky opened up. Fortunately Saturday was dry for the entire day and Sunday was wet so the typical problem of choosing the correct dry or wet setup was pretty easy. HMSA always attracts some pretty interesting cars and the Spring Club Races 2016 was no exception with examples ranging from Max Jamiesson’s 1935 Ford Sprint Car to Travis Engen’s Le Mans-winning Audi R8. Triumphs were celebrated with a race of their own, with TR3A, TR4, TR6 and even Spitfire models well represented. 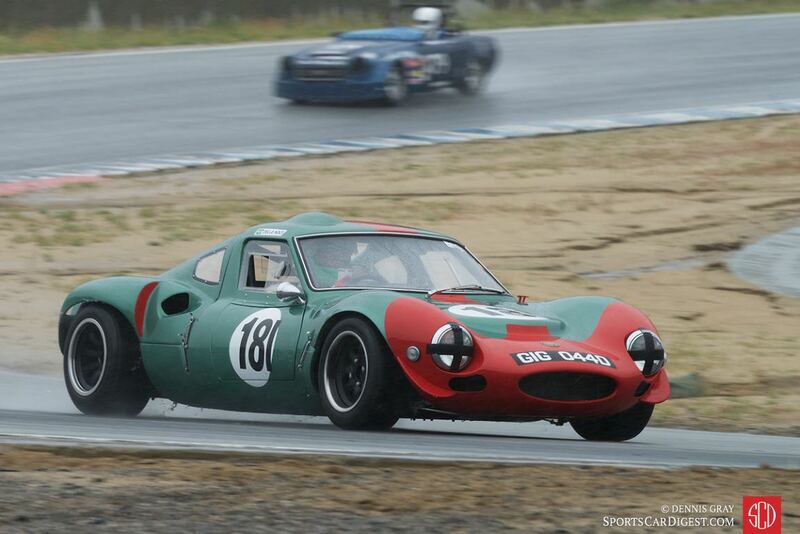 The East Coast racers were not put off by the wet weather and got in all the track time available both days. The car of the HMSA Spring Club Races 2016 race weekend had to be the Mercedes-Benz 300 SL ‘Gullwing’ of Alex Curtis. 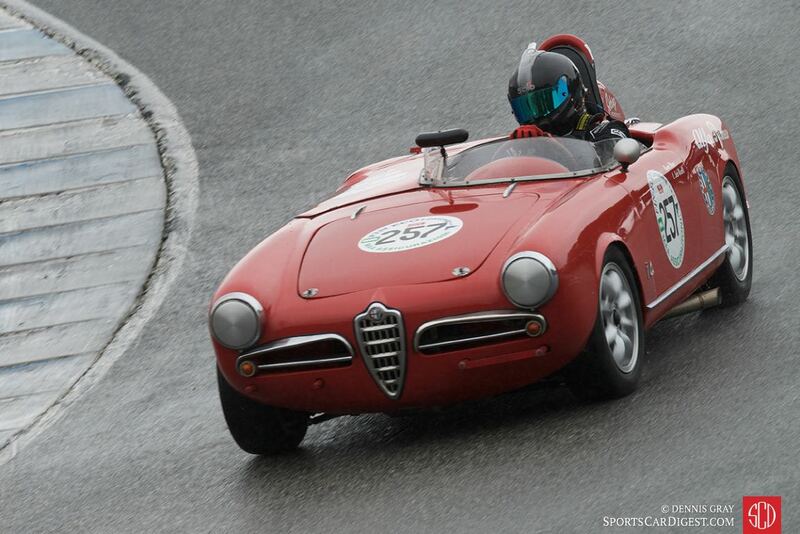 Racing in the rain, Alex had the Gullwing’s tail hanging out on every turn. It’s been a long time since I’ve seen a 300SL driven so quickly on a damp track. Exciting. For many participants the event was an opportunity to check off a few more items on the old bucket list. For some of the Triumph drivers who came all the way from back east, just getting on the famed Laguna Seca track was a thrill. But for many it was the chance to relive the Can-Am series or drop down the Corkscrew for the first time. Thankfully, the rain didn’t come down in buckets and it certainly didn’t dampen the spirit of those experiencing HMSA’s 2016 Spring Club Races. Plus it leveled the playing field and produced memories that will last a lifetime. Similar to 2010, 2011, 2012, 2013, 2014 and 2015, Sports Car Digest also documented the 2016 HMSA Spring Club Races with Senior Photographer Dennis Gray offering the following pictures from Laguna Seca. We split up Dennis’ 105 pictures into two galleries. The first gallery starting below features our favorite images, all displayed in the full-width view, while the second gallery can be found on the last page of the article and gives a comprehensive view of all the photographs. Fred Della Noce – 1964 Ginetta G12. Mark Sange – 1959 Lancia Dagrada during the damp Sunday group 1 race. 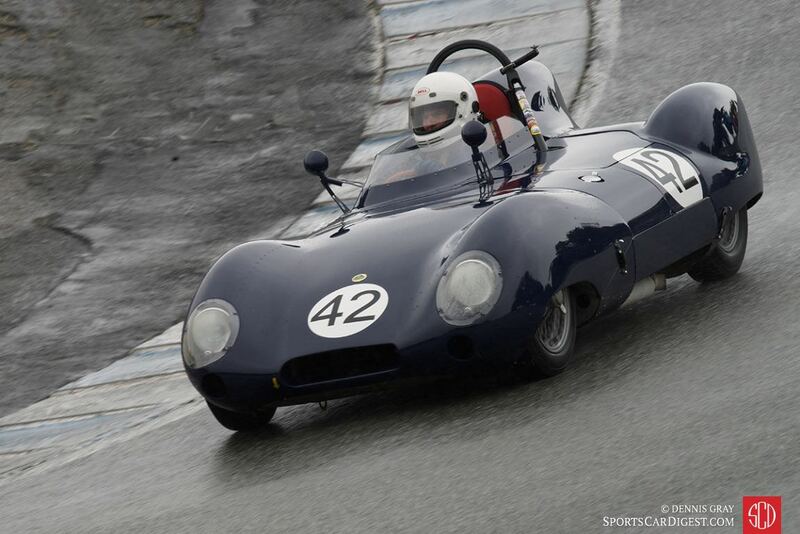 Arthur Cook – 1958 Lotus Eleven during Sunday’s wet race. Lars Mapstead – 1957 Alfa Romeo Spyder Monoposto. Jim Weissenborn – 1959 MG A.
Alex Curtis in his 1955 Mercedes-Benz 300SL after winning Sunday’s race. 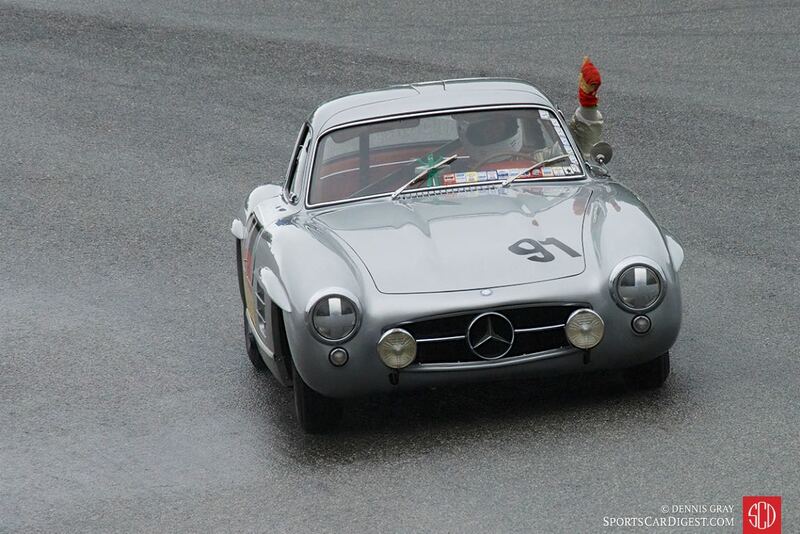 It’s been a long time since I’ve seen a 300SL driven quickly on a damp track. Exciting. Wah just love CHEVRON B16s, so beautifully proportioned, and good to see them chase the bigger ultimately faster T70 etc. Thank you. Thanks for the great shots Dennis. Intrepid – that’s clearly what you are, Dennis, for staying out there all weekend in that weather! Great images as always, loving the last few showing the tight racing at turn 11! Brabham B21C: Would that be a F2 car, and would a, say, 21F be a Formula Ford? Where the heck are the Datsun roadsters? Why are they seen only in the background and unmentioned?? They are a hell of lot rarer and better performers than either TR-4 or 6s. Wise up! I agree, where were the Datsun roadsters? Only one ran and is included on page five of the galleries. 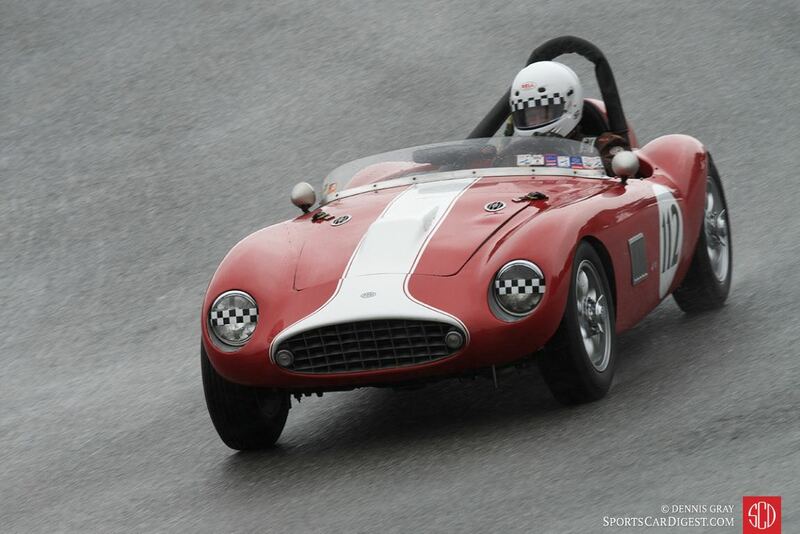 “Paul Adams – 1962 Elva Mk6 one of the nicest Mk. 6 around.” is such a great shot Dennis! Love the expression on the drivers face. 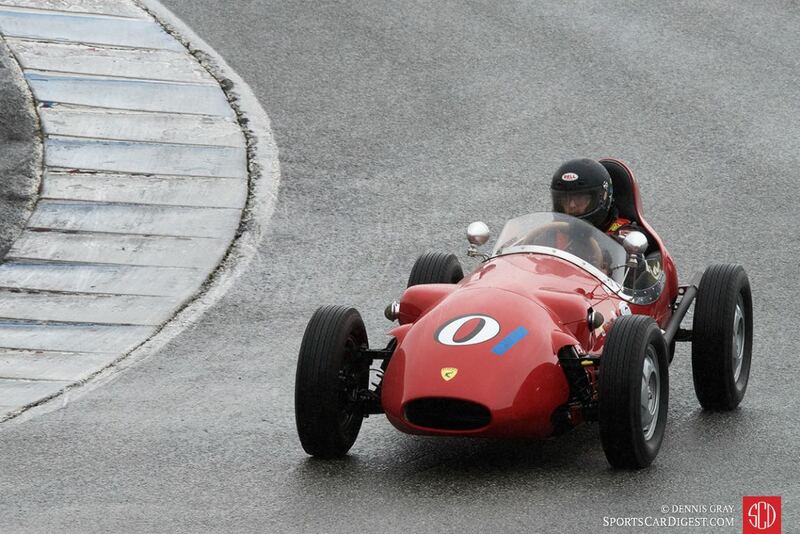 Isnt it great to see Stan Andares enjoying his Lotus Eleven (one of three that ran LeMans in ’56) at the yong ate if 85.